We profile two energy citizens: Jennifer Barkved from B.C. on why she supports LNG, and Kane Lam from Ontario on why he supports pipelines. COVER STORY Economic experts agree that access to new markets vital for Canada to take advantage of its resource riches and build long-term prosperity. 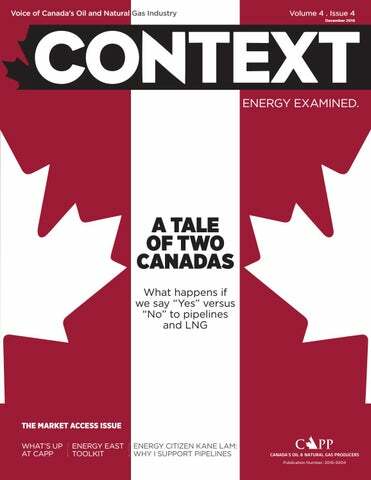 The official member magazine for the Canadian Association of Petroleum Producers (CAPP) ENERGY EXAMINED. CONTEXT CONCEPT, STRATEGY AND PRODUCT DEVELOPMENT Agnes Zalewski, Blunt Strategic CONTRIBUTORS Kathryn Boothby, David Coglon, Mark Cromwell, Jason Dziver, Jamie Emmelkamp, Nation Wong Printed in Canada by McAra Printing. Copyright © 2016 Canadian Association of Petroleum Producers. All rights reserved. Reproduction in whole or in part is strictly prohibited. DISTRIBUTION AND MEMBER UPDATES Janine Vandenberghe, administrative assistant CAPP Janine.Vandenberghe@capp.ca Please contact for changes in contact names and delivery addresses. Thank You Energy Citizens You spoke and your voice was heard. During a few weeks in November, Energy Citizens from across Canada sent more than 20,000 emails to Prime Minister Trudeau expressing support of the Trans Mountain Pipeline Expansion Project. On November 29, Canadians received an early Christmas present: approval of the Trans Mountain proposal. Thank you to all the Energy Citizens who participated—though, keeping in mind that our work isn’t done. Let’s keep standing up for oil and gas developed the Canadian way. Learn more at www.EnergyCitizens.ca and www.Facebook.com/CanadasEnergyCitizens. 140,000 followers on social media. INVESTME NT SYMPOSIUM THANKS TO 4:20 OUR 1 2016-08-25 PM SPONSOR, DENTONS. dentons.com © 2016 Dentons. Dentons is a global legal practice providing client services worldwide through its member firms and affiliates. Please see dentons.com for Legal Notices. *Acritas Global Elite Law Firm Brand Index 2013-2015. 92 municipal leaders—mayors, councillors, and chief administrators—visited the Syncrude and ConocoPhillips oil sands facilities. he says. “We were able to show municipal leaders firsthand how Canadian oil sands producers are leaders when it comes to running safe, sustainable operations and implementing world-leading environmental mitigation strategies.” Coonfer notes that feedback from the participants has been excellent, with most expressing an appreciation of the industry’s transparency and professionalism. For more information, contact Lee.Coonfer@capp.ca. What was our top Tweet? CAPP’s social media audience really liked this infographic highlighting the irony of Canada having to import oil from overseas. • AGI Envirotank Ltd. • GFL Environmental Inc.
Visit www.capp.ca/about-us/membership to view our full list of members. Enbridge Line 3 Replacement Program Approved On November 29, 2016, the federal government approved the Enbridge Line 3 Pipeline Replacement Project, subject to the 89 conditions identified by the National Energy Board during its review. The project will result in 370,000 barrels per day of additional capacity by restoring the line to its original capacity of 760,000 barrels per day. The project cost is estimated at $7.5 billion and has a target in-service date of 2019. “The project does not require an approval from the U.S. Department of State as the segment which crosses the international border was previously replaced as part of a maintenance project,” says Nancy Bérard-Brown, manager oil markets & transportation at CAPP. She adds that Enbridge has obtained regulatory approval from the North Dakota Public Service Commission, and the regulatory review in Minnesota is under way. In advance of the government’s decision, CAPP had provided a submission to Environment and Climate Change Canada, who was responsible for developing a GHG report on the proposal. Nancy Bérard-Brown, manager oil markets & transportation at CAPP. Enbridge’s Line 3 Pipeline from Edmonton, Alberta to Superior, Wisconsin has been in operation since 1968. Enbridge’s Replacement Program proposal would see the majority of the 1,660 kilometre pipeline replaced. catches up to supply, I expect we’ll see renewed interest in Canadian LNG. It may be, however, that we’ll have to wait a few years longer than initially anticipated. Q: Is it all about global supply, or are there factors within Canada making proponents pause? A: By coming out with a clear and competitive LNG tax regime last year, the B.C. government helped remove a lot of the uncertainty that had been troubling project proponents. That said, it’s always important for investors to see a country as a safe and viable destination for capital investments. I think it’ll be important for governments here to continue sending positive signals that Canada is open for business with regulatory decision-making processes that are transparent, effective and timely. Final investment decision by April 2017. STATUS Construction to commence in 2017 with first shipment in 2020. EARLY THIS YEAR the head of one of Canada’s largest banks stood in the Canadian Club of Toronto to make the case for building new pipelines. “At a time when the price of oil is low, conversations about pipelines might seem counterintuitive. But in fact these conversations are long overdue,” Scotiabank president and CEO, Brian Porter, told the audience of senior executives. “We must make global market access for Canadian energy a national priority today, and then make it a reality,” he stated. 37 per cent by 2030.
begin facing severe transportation bottlenecks. History has taught us that this will arrive with severe consequences. “If we continue to grow production out of the Western Canada Sedimentary Basin and don’t have takeaway capacity, we’ll run into a supply bottleneck that will again decrease commodity pricing. And that’s a problem,” says Michael Loewen, an energy commodities strategist at Scotiabank. capital investment over the past three years, equaling $44 billion. Want to download and share this? Visit the My Energy Library at membernet.capp.ca. POTENTIAL MARKETS: Asia STATUS: Federal approval overturned by judicial review and the government has decided to dismiss the proposal. STATUS: Approved November 29, 2016 with 157 conditions by the federal government. STATUS: NEB review ongoing, deadline is mid-2018. STATUS: Approved November 29, 2016 with 89 conditions by the federal government. STATUS: Rejected by U.S. President Barack Obama in Nov 2015. May be an opportunity to reapply in 2017 under incoming President Donald Trump. “LNG would create jobs and Jennifer and Kane are members of Canada’s Energy Citizens, a grassroots community of oil and natural gas supporters from all backgrounds and parts of the country. Since then, she’s joined forces with like-minded residents to form the Fort Nelson for LNG organization which has held rallies and brought in speakers. Barkved also participated in Rally with Resources, which sent a cross-Canada convoy to Ottawa in support of LNG. The group also sent 100,000 letters to local MP Bob Zimmer asking for approval of the Pacific NorthWest project. In 2015, virtually all Canada’s natural gas and crude oil exports were to one customer: the United States. There are, of course, good reasons for this. They are our closest neighbour and the only country with whom we share a land border. 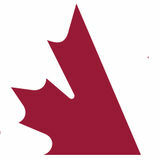 They are a longtime ally and a large market that buys a host of Canadian goods and services. On the energy front, however, that is changing. New techniques in accessing gas and oil from shale formations has unlocked large quantities of previously inaccessible resources. U.S. production of both natural gas and oil has increased dramatically. Strong and growing U.S. production has created significant competitive challenges for Canadian producers trying to export into the traditional U.S. market. Canadian exports to the U.S. of natural gas have fallen 23 per cent by volume from 2006 to 2015. The United States is now the number one producer of petroleum and other liquids, and the number one producer of natural gas in the world. While Canadian oil producers have managed to increase crude oil exports into the U.S. in recent years by displacing other import sources (e.g. Venezuela), overall growing production and a lack of export capacity have resulted in an oversaturated North American market. This has depressed prices relative to international benchmarks. Double Jeopardy: U.S. Now an Exporter On December 18, 2015, the United States lifted its 40-year ban on oil exports. The U.S. is also exporting increasing quantities of natural gas—notably into central Canada—and has even begun exporting LNG overseas. This means that Canada has one more competitor when selling oil and natural gas, both domestically and overseas. It’s another reason Canada needs to build infrastructure as soon as possible—to access new markets, enabling us to diversify our exports, and gain better prices in a cost-effective manner. GLOBAL ENERGY MIX TO 2040 Want to download and share this? Visit the My Energy Library at membernet.capp.ca. In its main scenario energy demand forecast for World Energy Outlook 2016, the International Energy Agency (IEA) predicts a 31 percent increase in global energy consumption by 2040. This increase is driven by growing energy consumption in non-OECD* countries like India and China. The forecast incorporates anticipated shifts towards lower-carbon policies arising from the 2015 Paris Accord. Production of all forms of energy increases to meet growing demand. By 2040, use of renewables jumps 473 per cent to meet six percent of total global energy demand. Natural gas use increases 49 per cent while oil demand increases 12 per cent. As a group, fossil fuels continue to meet 74 per cent of the worldâ&#x20AC;&#x2122;s energy needs. THE TRANSCANADA ENERGY EAST PIPELINE: EVERYTHING YOU NEED TO KNOW What is Energy East? Energy East is a proposal by TransCanada Corporation to build a 4,500 kilometre pipeline that would transport 1.1 million barrels of oil per day from Alberta and Saskatchewan to refineries in Eastern Canada and an export terminal in New Brunswick. TransCanada would take advantage of 3,000 kilometres of existing pipeline by converting the underutilized Mainline pipeline from gas to oil, and connecting it to a new section of pipeline built through a small section of southeastern Ontario, Quebec and New Brunswick. Myth Buster MYTH: Converting a gas pipeline to transport oil isn’t safe. The design, construction and placement of oil and natural gas pipelines is essentially similar, using the same materials and welding techniques. As a result, conversion of a pipeline to carry one product versus another is safe when properly executed. Indeed, TransCanada has done similar conversions in the past: most recently, it converted a section of the Canadian Mainline pipeline from gas to oil for delivery to the Keystone Pipeline in the U.S. Since July 2010, this converted pipeline has safely delivered nearly one billion barrels of oil into the United States. Some differences do exist between gas and oil pipelines—in particular the location of shut-off valves and pump stations. If Energy East is approved, TransCanada will install new valves and pump stations as necessary, while also performing a check of the structural integrity of the entire existing pipeline. Where It’s at and What You Can Do Energy East is being reviewed by Canada’s energy regulator, the National Energy Board (NEB). Public consultations have been temporarily suspended after the three panel members conducting the review decided to recuse themselves in order to preserve the integrity of the NEB and Energy East review. The proceedings will resume once a new panel is appointed. “While the review is suspended, it’s important for supporters of Energy East and increased market access for Canadian oil to keep letting key decision makers know that this is an important nationbuilding project for all of Canada,” says David Sword, advisor of Ontario communications and outreach for CAPP. “To keep in touch on all the latest, I’d highly recommend joining Canada’s Energy Citizens.” Learn more at www.EnergyCitizens.ca and www.Facebook.com/CanadasEnergyCitizens. You may find it unexpected that Canada, with the third-largest oil reserves in the world, imports hundreds of thousands of barrels of oil into Eastern Canada. In fact, Canadians in Atlantic Canada and Quebec spent $17 billion last year to import oil from the United States, Saudi Arabia, Algeria, Angola and Nigeria. That amounted to more than 50 per cent of the oil used in the region. Why not use Canadian oil? Well, currently, there is no continuous west-to-east pipeline that can carry large quantities of Western Canadian oil to refineries in Eastern Canada. This is a situation that Energy East would correct. In addition to its potential to help displace foreign oil from Canadian markets, Energy East would deliver oil to a marine terminal in Saint John, New Brunswick, for export to overseas markets—including to Asia, Africa and South America. This would help Canadian oil producers diversify their markets and get typically higher international prices for their oil. As of November 2016, more than Energy Citizens have pledged their support to building Canadian pipelines. Recognizing the potential economic benefits to Eastern Canada, New Brunswick Premier Brian Gallant has expressed strong support for the Energy East pipeline proposal.